California's Lake County, GE, and SunPower partnered on a multi-site 2.2-megawatt solar power system that-combined with an existing solar power installation-now makes Lake County home to the largest solar power installations on county facilities in California. Situated northeast of San Francisco, Lake County is not the most populous county in California, nor is it the richest. But progressive thinking on the part of the board of supervisors and Lake County Sanitation District has allowed the county to become a leader in sustainable resource development and use. In fact, Lake County is now a net energy producer. "The board of supervisors has taken a leadership role of becoming sustainable and becoming energy efficient. They did it prior to a lot of other counties, and we continue to do it," says Denise Rushing, Lake County supervisor representing District 3. "They were very receptive to solar and focused on energy efficiency." As a result, the county now has 3.1 megawatts of solar-generated power, making it the largest solar-energy system on county property in California. But the county probably wouldn't have been able to finance and build such large projects on its own. 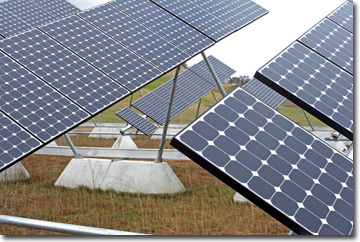 Rushing credits the SunPower Access Power Purchase Agreement (PPA) as the catalyst. There were three separate sites for the Lake County solar project: the northwest wastewater site with 998 kW; the southeast wastewater site with 735 kW; and a jail site with 746 kW. Under that agreement, GE Energy Financial Services financed, and will own, a 2.1 MW project. 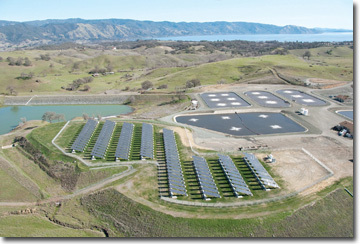 SunPower Corp. of San Jose designed and built the project and will maintain it for 20 years. In return, Lake County provided the land on which to build the systems and agreed to buy the power at an established price for the life of the contract. 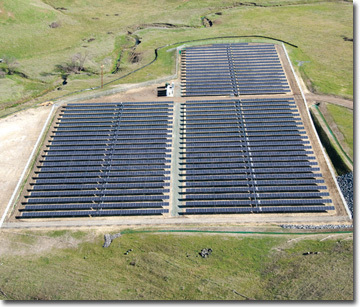 A separate 1 MW PV project was built by the Lake County Sanitation District and power company, Calpine Corporation. "I think a PPA is very attractive, but it depends on the nature of the agreement," Rushing says. One of the deciding factors is the price of electricity and the escalation factors used to determine future rates, she says. But that's only part of the equation. "You make some assumptions about what power rates are doing over time," she says. "But there has to be an incentive for a company to operate it-and operate it well-and have it in as good of shape as in the beginning. Maintenance has to be performed. All of those are part of the process." SunPower is able to address those concerns with its own in-house operations and maintenance division that is experienced working with SunPower tracking systems and arrays, says Matt Giannini, project development manager with SunPower Corp.
"Having our entire service organization in house gives us a lot more control over that," he says. "The great thing is if you have an issue with one of our trackers, for example, we manufacture and design those trackers so we don't have to call a third party to get it serviced." The client also deals with just one firm, simplifying maintenance, he says. Lake County already had invested in energy sustainability in 1997 when Lake County Sanitation District (LACOSAN) developed the world's first wastewater-to-electricity system. Wastewater Treatment Plant in Lakeport and Southeast Wastewater Treatment Plant in Clearlake is pumped 26 miles to the southern portion of The Geysers geothermal field. The Geysers, 72 miles north of San Francisco, comprises 350 wells and 19 geothermal power plants that have an installed capacity of 1,517 MW. The treated wastewater is injected underground to enhance the existing steam reservoir. It is responsible for about 77 MW of effluent-based power generation capacity that would otherwise not be available. The Geysers geothermal field provides about 70 percent of the average power demand for the North Coast from the Golden Gate Bridge to the Oregon border, an area comprising about 1 million households. "We're taking that project and adding solar, so you have a completely renewable system," Rushing says. "We're using solar power for water pumping, and taking that water and injecting it into the geysers to produce power once again." Lake County's buildings didn't have a lot of roof space or carports on which to mount the arrays, so SunPower decided ground-mount systems were the only viable option. 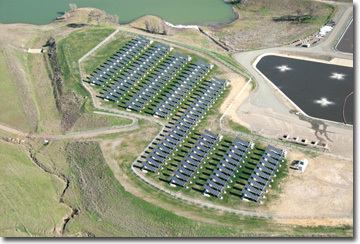 Lake County began looking at solar generation in 2007, shortly after Rushing was elected to the board. Although the supervisors always have been energy conscious, she says her background helped the board identify new energy-saving and money-saving opportunities. Rushing had worked for Pacific Gas & Electric Co. for 15 years. In addition, she'd worked five to six years for energy technology companies. "When we began discussing energy efficiency in the county, one of the things that concerned us was it wasn't just about sustainability," she says. "It's about the local economy. Every dollar we spend on energy leaves the economy. It's also an expense that is really unnecessary." With more than 300 sunny days a year and mild temperatures, Lake County is well suited to solar technology, she says. As part of its exploration, the board looked at which facilities within the county had predictable year-round energy use and which ones were the biggest electricity users. The Northwest Wastewater Treatment Plant in Lakeport and the Southeast Wastewater Treatment Plant in Clearlake-both operated by LACOSAN-and the county jail in Lakeport were prime candidates. After responding to a request for proposals, SunPower was awarded the contract to build the 2.17 (DC) MW project on three county sites in 2007. One of SunPower's attractions was it offered what was essentially a turnkey project, Rushing says. The company could also perform an initial energy audit, so the county could see where low-cost improvements in energy efficiency could be made. In addition, she says SunPower had a strong track record for systems operation and maintenance. Although working on a government project can be more complicated than one for the private sector, Giannini says SunPower had the experience and personnel to address those challenges. "With a government project, there's a lot more accountability," he says. "There are many more constraints. They want to make sure they are getting the best value they can from solar energy. There are a lot more rules to abide by. It's a much more rigid evaluation process." In California, environmental regulations, such as the California Environmental Quality Act (CEQA), add to the complexity. CEQA requires that an entity conduct an environmental impact review on projects that require state or local governmental approval. Giannini says. So SunPower decided ground-mount systems were the only viable type. Adding to the challenges of the Lake County project was the hilly terrain, Giannini says. Much of the land was not suitable for siting ground-mount PV systems. The sites also had to be close to meters that served the two wastewater treatment plants and the jail. SunPower's in-house design team identified three parcels that totaled 15.5 acres that met the requirements. Even then, the company had to work around a sensitive wetland adjacent to one of the parcels. To maximize production on the limited space, SunPower recommended a combination of its T0 Tracker and T20 Tracker single axis units. When used with SunPower E18 modules, the system would have the highest energy density (energy output per acre) possible. To maximize production on the lim-ited space, Giannini says SunPower recommended a combination of its T0 Tracker and T20 Tracker single-axis units. When used with SunPower E18 modules, the system would have the highest energy density (energy output per acre) possible. Compared with conventional fix-tilt systems, SunPower's tracking systems increase sunlight capture by up to 30 percent. "This was particularly important for Lake County," he says. "Because it's relatively hilly, we didn't have a lot of space, and we had some sensitive areas, so we were really constrained in the area we could utilize." SunPower acts as the general contractor on projects and tries to use local trades people when appropriate. "Whenever we are doing a project, we will always check out the local subs," Giannini says. "It's really important for the local community and for us because these people are familiar with the site." Permitting and design occurred at the end of 2007. Once construction began in 2008, the project went fairly quickly, he says. Security was not a concern since the tracker systems and arrays were installed on land adjacent to, but not within, the confines of the jail, Giannini says. Broken down, the jail site consists of 3.8 acres of array with 746 kilowatts (AC) of installed capacity; the northwest wastewater site, 6.8 acres and 998 kW; and the southeast wastewater site, 735 kW. The three systems required a total of 9,430 modules. On this project, SunPower went with Schneider Electric Xantrex inverters. Since the project came online in February 2009, it has operated at 104 percent of rating, Giannini says. The production will meet about 91 percent of the average electricity needs of the two wastewater plants and the jail. SunPower has been involved in the installation of thousands of MWs and can draw from that empirical data on which to base projections. "We can look at the performance of these systems in any type of environment and predict with high precision," Giannini says. "This is becoming really important with public sector clients." Based on initial estimates, Rushing says the county expected to save at least $1 million on electricity during the life of the contract. But those estimates were conservative. "One of the things the board considered when we approached this project is you're making assumptions that PG&E rates are going to be going up," says Rushing. Not only are the rates going up, they are going up dramatically, she says. "This gives us an opportunity to buy power from our own facilities," she says of the solar installations.